Sirius broadcasts a variety of music, news, sports, weather, traffic and entertainment satellite radio channels. For more information and a complete list of Sirius satellite radio channels, visit www.siriusxm.com in the United States, www.sirius.ca in Canada, or call Sirius at 1–888–539–7474. This receiver includes the eCos real-time operating system. eCos is published under the eCos License. 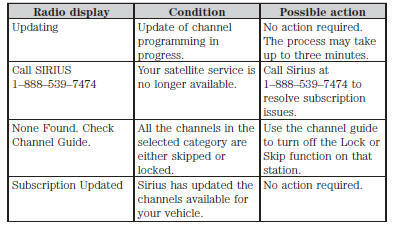 Sirius reserves the unrestricted right to change, rearrange, add or delete programming including canceling, moving or adding particular channels, and its prices, at any time, with or without notice to you. Ford Motor Company shall not be responsible for any such programming changes. Sirius satellite radio is a subscription-based satellite radio service that broadcasts a variety of music, sports, news, weather, traffic and entertainment programming. 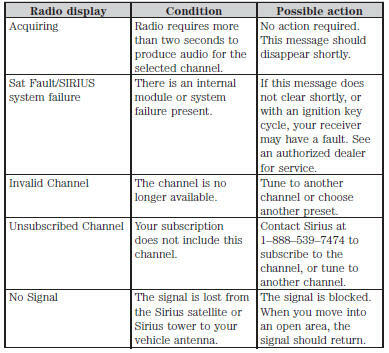 Your factory-installed Sirius satellite radio system includes hardware and a limited subscription term which begins on the date of sale or lease of your vehicle. See an authorized dealer for availability. For more information on extended subscription terms (a service fee is required), the online media player and a complete list of Sirius satellite radio channels, and other features, please visit www.siriusxm.com in the United States, www.sirius.ca in Canada, or call Sirius at 1–888–539–7474. 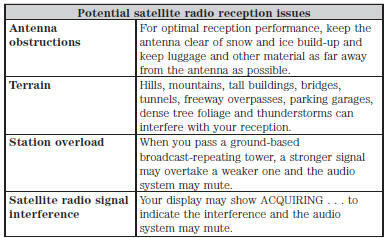 You need your ESN to activate, modify or track your satellite radio account. When in satellite radio mode, you can view this number by pressing SIRIUS and memory preset 1 at the same time. To access your ESN, press the bottom left corner of the touchscreen, then SIRIUS > Options.